Second nights, roads untaken and The Beast Below (2010) | Randomwhoness: a Doctor Who blog by Johnny Spandrell. Sampling stories in random order. Way back when talking about The Highlanders, I mentioned the odd appeal of a Doctor’s second story. It’s the place where we get our first true glimpse of what a new Doctor’s going to be like, without all the opening night hoopla of his first story. But we also get to see a few missteps and a few character traits which eventually get left on the cutting room floor. I don’t think it’s any disrespect to say that Matt Smith took a while to step out of David Tennant’s shadow. Having been cast as a young, funny, handsome Doctor immediately after the last young, funny, handsome Doctor was a tough gig. And his early stories don’t help him. I don’t think there’s anything in The Beast Below (aka Song of the Space Whale) or the stories around it for Matt Smith to do that David Tennant couldn’t. 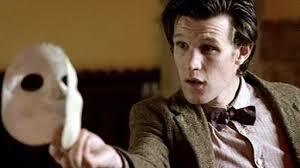 It seems hard for the series’ writers to shake Ten off, and for everyone – Smith included – to realise that the Eleventh Doctor’s goofiness, distractedness, childlike glee and his strange knack of being physically graceful and awkward simultaneously is what distinguishes him from the Tenth. In fact, I don’t think it’s until Vincent and the Doctor (aka Two Ginger Scots and the Doctor) that Smith’s Doctor is fully formed, although there are glimpses of it earlier. Perhaps the first peek of it is when he springs from Rory’s buck’s night cake (do buck’s nights have giant cakes? If so, I’ve been going to the wrong ones) in The Vampires of Venice (aka The Fish Girls of Croatia). But back to Smith’s performance in The Beast Below. The sudden enthusiasm for small details, the tendency for unexpected physicality (leaping over benches for example) and the mix of levity and gravitas – so far so Tennanty. But there are moments when you can begin to see Smith differentiating himself from his predecessor. Take the moment where Amy asks if there are any other Time Lords. We can imagine how Tennant would have played this from a host of similar moments during his tenure. AMY: So there are other Time Lords, yeah? TENTH DOCTOR: (Suddenly stops. Face falls.) No. There were, but there aren’t. Just me now. (For a moment, looks like he might cry. Runs hand through hair, spiking it up further.) Long story. There was a bad day. Bad stuff happened. (Pause, determined now, the old soldier is back) And you know what? I’d love to forget it all, every last bit of it, but I don’t. (Anger in his voice, rising to a crescendo. A sudden flurry of activity.) Not ever! Because this is what I do, every time, every day, every second! This! Hold tight! (Turns, pauses, looks Amy in the eye, brings his voice down, adds a hint of glee.) We’re bringing down the government. (Hits the ‘protest’ button). Ooh, that’s done it! Oh yes! Smith plays it much cooler. In his version, when the Time Lords are mentioned a pensive look comes over his face. He says the dialogue quietly, as if explaining it to himself as well as Amy. Almost as if remembering a bad dream. Then he gently ramps up towards the end of the speech, less showily than Tennant would have, before smacking that button with vigour. DOCTOR: Look, three options. One, I let the Star Whale continue in unendurable agony for hundreds more years. Two, I kill everyone on this ship. Three, I murder a beautiful, innocent creature as painlessly as I can. And then I find a new name, because I won’t be the Doctor any more. LIZ: There must be something we can do, some other way. DOCTOR: Nobody talk to me. Nobody human has anything to say to me today! (Quick aside: it’s interesting that writer Steven Moffat is already referencing the last day of the time war and the Doctor’s name, both of which will the focus of crucial episodes at the end of Smith’s tenure). These sudden furious outbursts were stock in trade for the Tennant, but they become rarer and rarer for Smith. A notable exception is the tirade at Colonel Manton in A Good Man Goes to War (“…trying to get to me through the people I love“); on that occasion he even notes that getting angry is new to him. As the Eleventh Doctor develops, Smith prefers to play these moments with quiet menace or distain. And that suits the slippery, manipulative figure his Doctor becomes in later seasons. It’s not that Smith plays the star whale rant badly – quite the opposite – but it’s another remnant of a past era that he sheds. Finally, there’s a moment of pure pig headed vindictiveness from the Doctor which doesn’t suit him at all. AMY: I voted for this. Why would I do that? DOCTOR: Because you knew if we stayed here, I’d be faced with an impossible choice. Humanity or the alien. You took it upon yourself to save me from that. And that was wrong. You don’t ever decide what I need to know. AMY: I don’t even remember doing it. DOCTOR: You did it. That’s what counts. DOCTOR: Oh, I don’t care. When I’m done here, you’re going home. Of course, it is completely unreasonable of the Doctor. As Amy points out, she doesn’t even remember doing it. And it’s an odd moment because it just doesn’t seem like a hanging offence or something that would particularly irk the Doctor. In short, it’s out of character. Although it does provide a dramatic moment after which Amy can redeem herself by working out the mystery of the star whale. But it feels contrived; as if providing that spur for Amy is its sole purpose, rather than being a natural thing for the Doctor to say. And we never see another Eleventh Doctor moment like it. It’s one of those character roads which is partially ventured down but ultimately left unexplored. Charm, daffiness and childlike enthusiasm won out. Brooding, unpredictable grump was left behind. And his Doctor was all the better for it. One last thing: the story ends with a Hartnellesque lead-in to the next episode. Winston Churchill rings the TARDIS phone and asks for the Doctor’s help, the silhouette of a Dalek sliding into view on a nearby wall. It’s a moment which echoes our first, partial glimpse of a Dalek sucker back in 1963. But it’s also one which indicates how much Doctor Who has changed since then. The Doctor was once an edgy anti-hero lost in time and space, with no control over his capricious machine. Now he’s a superhero, getting phone calls for help from his celebrity historical friends. It’s another big shift. And this one, I’m not so sure is for the better. LINK to Nightmare of Eden. Both are set on spaceships and have creatures that are not what they seem. Hmm, that will have to do! NEXT TIME… There’s a bit of a brouhaha at the Space Defence Station in The Android Invasion.